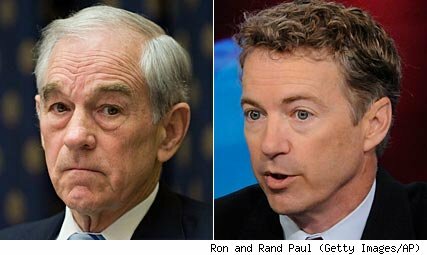 Father and son, together in the Senate: Ron Paul for TX-Sen in 2012? Rep. Ron Paul (R-Texas) says a new poll that shows him a a top choice among Texas Republicans to run for Senate has him thinking about the race. “It’s certainly crossed my mind,” Paul told The Ballot Box of a potential run for Sen. Kay Bailey Hutchison’s (R-Texas) Senate seat next year. New numbers out Wednesday from Democratic-leaning Public Policy Polling found Paul was second only to Lt. Gov. David Dewhurst (R) among Texas Republicans asked who they want to see run for the seat in 2012. The poll found Dewhurst to be the top choice of Republicans, garnering 23 percent support. But Paul was right behind him as the pick of 20 percent of GOP voters. Ron Paul, who ran for president in 1988 (as a libertarian) and for the republican presidential nomination in 2008 (as a sort of republican Howard Dean – lots of netroots support, but few votes), has a son, Rand, who was elected to represent Kentucky in the Senate last November. I’m not going to comment on political dynasties here, but I will say that it’s hilarious that under Senate rules, should Ron Paul be elected, he’ll actually be more junior than his son, because he’ll have taken up his position two years later than his kid Rand. On a serious note, much as I disagree with Ron Paul on pretty much every single economic issue you can name (he’s for abolishing pretty much every single government agency you can think of, and for reinstituting the gold standard), it’d be nice to have at least one pacifist senator who’s against the war on drugs. I kind of want him to run and win. It’s not like the democrats have a chance to pick up a Senate seat in Texas anyway.